Ready to replace your 1970’s mill technology with something better? After more than four decades of using the same old-run-of-the-mill emulsion mill technology, it's time for a change. Bergkamp Bituminous Solutions introduces a new king of the mill. And we're so confident in our BKM Colloid Mill, we're offering a 5-year limited warranty - including the rotor and stator - with an onsite maintenance plan. They can produce emulsion with higher percentages of asphalt more efficiently and less expensively. The BKM Colloid Mill's Rotor and Stator is designed with more teeth placed closer together to transfer more shear energy into the materials increasing the power of the mill. Bergkamp Mill's Rotors and Stators are manufactured with a special steel alloy that does not wear or corrode easily. Adjustable mill gap to allow the operator to simply and easily optimize emulsion production. What does that mean for a Bergkamp mill owner? The Bergkamp Colloid Mill is designed to provide greater Shear Energy for a more efficient transfer. This is why our mill operates with a smaller motor, saving you money. 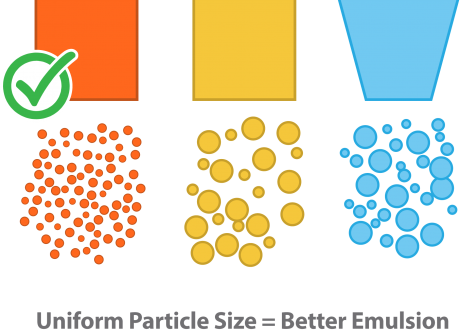 Bergkamp's PSD (Particle Size Distribution) increases the shelf life of the emulsion and improve its ability to be trucked to job sites intact. Unlike Dalworth and Charlotte mills, the Bergkamp mill is backed with a 5-year limited warranty that includes the rotor and stator. Our mill is designed to produce consistent particle size distribution, improving the breaking and curing time, as well as the viscosity.